Italy’s top retail lender kept a dividend promise despite a weak fourth quarter and pruned 16 billion euros of dud loans from its balance sheet. That justifies its valuation premium over many rivals. But with the economy weakening at home, a richer one seems a big ask. An Intesa Sanpaolo Bank logo is seen in Milan, Italy, October 1, 2013. 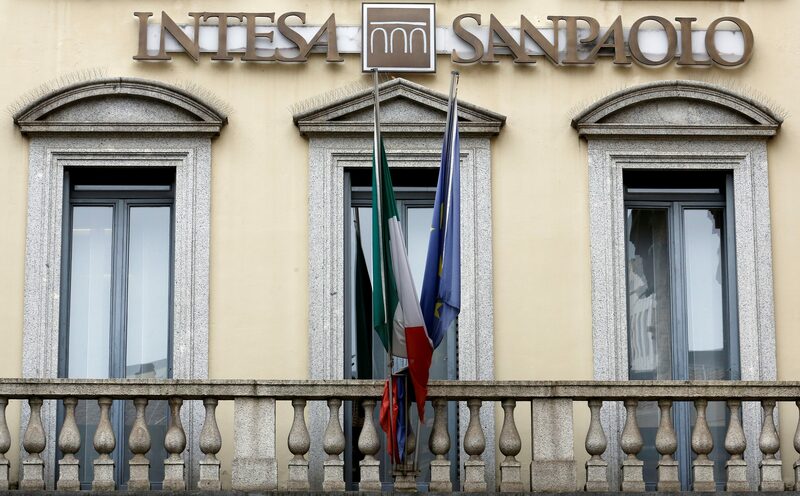 Intesa Sanpaolo, Italy’s biggest bank by market capitalisation, on Feb. 5 said its net profit fell to 4.1 billion euros in 2018. This compares with 3.8 billion euros in 2017 after excluding a 3.5 billion euro cash payment from the Italian state to take over two failed regional banks. It reported net profit of 1.04 billion euros for the fourth quarter of 2018, down 27 percent from the same period in 2017. The Italian lender proposed cash dividends of 3.4 billion euros, meeting a targeted payout ratio of 85 percent. Intesa said its pro-forma fully loaded common equity Tier 1 capital ratio, a measure of capital strength for banks, was 13.6 percent at the end of December compared with 13.7 percent in September. Intesa Sanpaolo shares were up 0.9 percent at 1300 GMT on Feb. 5.